I‘ve never been a fan of tearing down our Civil War monuments because I tend to think that such a move only works to make us feel better. Although the removal of monuments reflects the very same political, economic, and social conditions that led to their being initially placed in prominent spots it almost always fails to address a controversial past that has helped to divide a community. One alternative is to add some kind of marker to the historic site that educates the visitor as to why a statue was placed in a particular spot and that offers a more complete interpretation of the event/individual being commemorated. This is what the citizens of Frederick, Maryland have done with a prominent statue of Chief Justice Roger Taney that was dedicated in 1931. 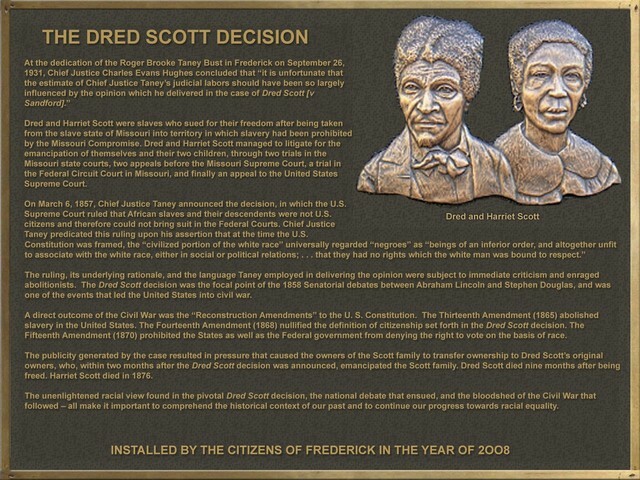 Now visitors can read a small plaque that outlines the infamous ruling in the Dred Scott v. Sanford as well as its long-term consequences. Not only does it educate, but it gives voice to both Dred and Harriet Scott as well as a community whose past has all too often been ignored. Thanks for posting this, Kevin. I live near Frederick and have always felt perturbed at the town's recognition of such an infamous character (in my opinion, of course!). I've tried to place it in historical context, but even then I've never wrapped my mind around the bust at city hall, museum at his house, roads and locations named after him, etc. Finally, there is – as you stated – something to recognize the “voice” of those so horribly affected by Taney's decisions. (For the record, locals pronounce it TAW-ney, in case anyone was wondering.) One satisfaction is knowing that he is buried in a town cemetery that also provides a final resting place for many African-Americans; one such burial is that of a black soldier from the War of 1812. I know it may be wrong, but this irony has often given me a smug satisfaction. This leads to my question: Do you know if this was common practice in the mid-late 19th century? That is to say, is it not unique for a white man of Taney's 'stature' to lie buried with African-Americans in a small-town cemetery? Again, thanks for the informative post! Nice to hear from someone in the Frederick area. Unfortunately, I am unable to respond to your question, but one of my readers may know something. It's not uncommon for African Americans to be buried with whites, particularly in southern church plots (given that in the South, as John Boles has shown, churches were sometimes amazingly bi-racial and equitable). It should be noted, however, Taney is buried in the Catholic cemetery in Frederick not one of the public cemeteries, so all the internments fall under that church's decision-making process (private entity, and that particular church has always had space issues in their cemetery). As for Kevin's original thought, I agree totally that explaining both sides of the story is the most important thing to do with memorials (I'm originally from Frederick as well). Taking down the statue, monument, or other commemoration merely erases an opportunity for dialogue and education. And while I am in no way defending Taney or his Dred Scott ruling, Taney had a long and important career in politics (law partner of Francis Scott Key, key player in the U.S. Bank controversy with Andrew Jackson, and as a Supreme Court justice) and there is nothing wrong with remembering him or discussing him as a local notable as long as we remember all sides of the story and talk about the implications of that history (then and now). Thanks so much for the response. I agree with you re: the importance of considering Taney's public career in its entirety. Excellent points. Furthermore, the Taneys were an important family in Maryland, not just Roger, and Roger married the sister of his great friend, Francis Scott Key. I still think the best work on Dred Scott is the one by the late Don Fehrenbacher. It's not uncommon for African Americans to be buried with whites, particularly in southern church plots (given that in the South, as John Boles has shown, churches were sometimes amazingly bi-racial and equitable). It should be noted, however, Taney is buried in the Catholic cemetery in Frederick not one of the public cemeteries, so all the interments fall under that church's decision-making process (private entity, and that particular church has always had space issues in their cemetery). Timothy Huebner wrote an excellent piece about Roger Taney in the June, 2010, issue of _The Journal of American History_. Huebner contrasts Taney’s earlier actions with his later judicial writings as Chief Justice, when Taney consistently protected the property rights of slaveholders at the expense of individuals, Northern states’ rights, and, finally, the US Congress. This is a tough one; no easy answers here. Next post: Hey! Richard Dreyfuss! Leave Them Kids Alone! Previous post: $250,000 for a Reenactment?